Abstract. 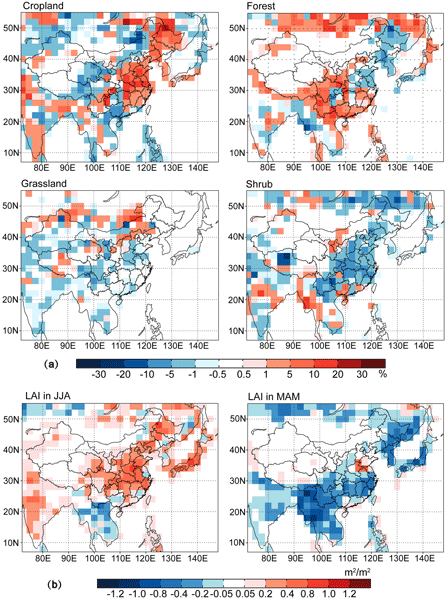 Understanding how historical climate and land cover changes have affected tropospheric ozone in East Asia would help constrain the large uncertainties associated with future East Asian air quality projections. We perform a series of simulations using a global chemical transport model driven by assimilated meteorological data and a suite of land cover and land use data to examine the public health effects associated with changes in climate, land cover, land use, and anthropogenic emissions between the 5-year periods 1981–1985 and 2007–2011 in East Asia. We find that between these two periods land cover change alone could lead to a decrease in summertime surface ozone by up to 4 ppbv in East Asia and ~ 2000 fewer ozone-related premature deaths per year, driven mostly by enhanced dry deposition resulting from climate- and CO2-induced increase in vegetation density, which more than offsets the effect of reduced isoprene emission arising from cropland expansion. Climate change alone could lead to an increase in summertime ozone by 2–10 ppbv in most regions of East Asia and ~ 6000 more premature deaths annually, mostly attributable to warming. The combined impacts (−2 to +12 ppbv) show that while the effect of climate change is more pronounced, land cover change could offset part of the climate effect and lead to a previously unknown public health benefit. While the changes in anthropogenic emissions remain the largest contributor to deteriorating ozone air quality in East Asia over the past 30 years, we show that climate change and land cover changes could lead to a substantial modification of ozone levels, and thus should come into consideration when formulating future air quality management strategies. We also show that the sensitivity of surface ozone to land cover change is more dependent on dry deposition than on isoprene emission in most of East Asia, leading to ozone responses that are quite distinct from that in North America, where most ozone-vegetation sensitivity studies to date have been conducted. How to cite: Fu, Y. and Tai, A. P. K.: Impact of climate and land cover changes on tropospheric ozone air quality and public health in East Asia between 1980 and 2010, Atmos. Chem. Phys., 15, 10093-10106, https://doi.org/10.5194/acp-15-10093-2015, 2015. 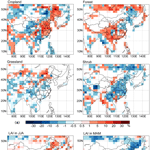 Historical land cover and land use change alone between 1980 and 2010 could lead to reduced summertime surface ozone by up to 4ppbv in East Asia. Climate change alone could lead to an increase in summertime ozone by 2-10ppbv in most of East Asia. Land cover change could offset part of the climate effect and lead to a previously unknown public health benefit. The sensitivity of surface ozone to land cover change is more dependent on dry deposition than isoprene emission in most of East Asia.